Mr. Lee teaches four courses at this time. Please read the course descriptions below. CompApps has now been replaced with Intro to Business Technology in the Small Business and Entrepreneurship Pathway. I have saved projects from the original CompApps as an archive for reference purposes. Introduction to Digital Technology is the foundational course for Web & Digital Communications, Programming, Advanced Programming, Information Support & Services, and Network Systems pathways. This course is designed for high school students to understand, communicate, and adapt to a digital world as it impacts their personal life, society, and the business world. Exposure to foundational knowledge in hardware, software, programming, web design, IT support, and networks are all taught in a computer lab with hands-on activities and project-focused tasks. Students will not only understand the concepts, but apply their knowledge to situations and defend their actions/decisions/choices through the knowledge and skills acquired in this course. Employability skills are integrated into activities, tasks, and projects throughout the course standards to demonstrate the skills required by business and industry. Competencies in the co-curricular student organization, Future Business Leaders of America (FBLA), are integral components of both the employability skills standards and content standards for this course. form a comprehensive introduction to the digital world. Introduction to Digital Technology is a course that is appropriate for all high school students. Using web design as the platform for product design and presentation, students will create and learn digital media applications using elements of text, graphics, animation, sound, video and digital imaging for various format. The digital media and interactive media projects developed and published showcase the student skills and ability. Emphasis will be placed on effective use of tools for interactive multimedia production including storyboarding, visual development, project management, digital citizenship, and web processes. Students will create and design web sites that incorporate digital media elements to enhance content of web site. Various forms of technologies will be used to expose students to resources, software, and applications of media. Professional communication skills and practices, problem-solving, ethical and legal issues, and the impact of effective presentation skills are enhanced in this course to prepare students to be college and career ready. Employability skills are integrated into activities, tasks, and projects throughout the course standards to demonstrate the skills required by business and industry. Competencies in the co-curricular student organization, Future Business Leaders of America (FBLA), are integral components of the employability skills standard for this course. Digital Design is the second course in the Web and Digital Design pathway in the Information Technology cluster. Students enrolled in this course should have successfully completed Introduction to Digital Technology. 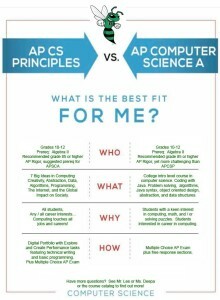 The AP Computer Science Principles course is designed to be equivalent to a first semester introductory college computing course. AP Computer Science Principles introduces students to the foundational concepts of computer science and challenges them to explore how computing and technology can impact the world. 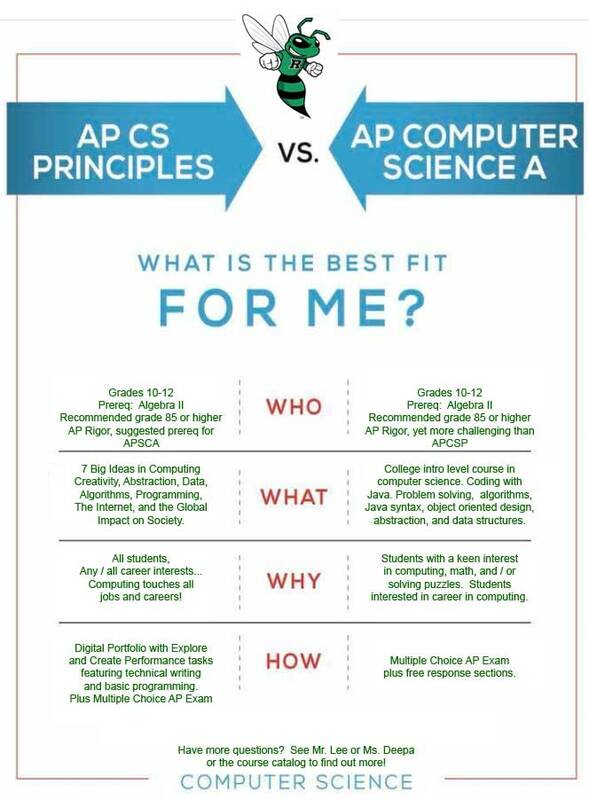 With a unique focus on creative problem solving and real-world applications, AP Computer Science Principles prepares students for college and career. Code.org’s Computer Science Principles (CSP) curriculum is a full year, rigorous, entry level course that introduces high school students to the foundations of modern computing. The course covers a broad range of foundational topics such as programming, algorithms, the Internet, big data, digital privacy and security, and the societal impacts of computing. We will be integrating other lesson units into the Code.org curriculum including the EarSketch App which was created by Georgia Tech University! Computer science embraces problem solving, hardware, algorithms, and perspectives that help people utilize computers to address real-world problems in contemporary life. As the study of computer science is evolving, the careful design of the AP Computer Science A course and exam continues to strive to engage a diverse student population, including female and underrepresented students, with the rigorous and rewarding concepts of computer science. Students who take the AP Computer Science A course and exam are well prepared to continue their study of computer science and its integration into a wide array of computing and STEM-related fields. The AP Computer Science A curriculum provides resources, such as application-related labs, that connect with students with diverse interests, particularly female and under-represented student populations. The course is engaging and underscores the importance of communicating solutions appropriately and in ways that are relevant to current societal needs. Thus, a well-designed, modern AP Computer Science A course can help address traditional issues of equity, access, and broadening participation in computing while providing a strong and engaging introduction to fundamental areas of the discipline. The AP Computer Science A course introduces students to computer science with fundamental topics that include problem solving, design strategies and methodologies, organization of data (data structures), approaches to processing data (algorithms), analysis of potential solutions, and the ethical and social implications of computing. The course emphasizes both object-oriented and imperative problem solving and design. These techniques represent proven approaches for developing solutions that can scale up from small, simple problems to large, complex problems. The AP Computer Science A course curriculum is compatible with many CS1 courses in colleges and universities. Some colleges and universities may organize their curricula in alternative ways, so that the topics of the AP Computer Science A course are spread over several college courses, with other topics from computer science interspersed. Prior experience with the rigors of an AP course load. A PSAT Math score of 600 or higher. The prerequisite for this course is Intro to Digital Technology and/or a grade of “B+” or higher in an Algebra 2 math course or equivalent. Coursera – is this the future of education? For those students who are self-directed and self-motivated, Coursera offers college level courses online for free! Coursera is partnering with Princeton, Stanford, the University of Michigan, and the University of Pennsylvania to offer online courses. To see the new courses and sign up for free, please go to http://coursera.org/. Course offerings span a broad range of topics, including Computer Science, the Humanities, Medicine, Biology, Social Sciences, Mathematics, Statistics, Economics, Finance, and many other topics. We have a total of about 40 courses, of which 6 are planned to launch next Monday (April 23rd, 2012), so sign up soon. Whether you’re looking to improve your resume, advance your career, or just learn more and expand your knowledge, we hope there’ll be multiple courses that you find interesting. Even more courses will be announced over time, and you can find a list of our current offerings at http://coursera.org/courses. Classes offered on Coursera are designed to help you master the material. You’ll be able to watch lectures taught by world-class professors, learn at your own pace, test your knowledge, and reinforce concepts through interactive exercises. When you join a Coursera class, you’ll also join a global community of thousands of students learning alongside you. We bring courses from the top universities to you, for free. Get your friends to take a class with you. Sign up at http://coursera.org/.